The concept of the Guardians is a new one. Beings superior to Timelords that seem to sit outside the Universe watching. There is no real attempt to explain what or who they are except that it is obvious that they are pretty powerful. Tom Baker emphasises this not by showing obvious fear but by his scenes with the White Guardian like a naughty schoolboy. All yes sir, no sir & three bags full sir. Being a script by Robert Holmes it has a double acts - The Doctor & Romana; Garron & Unstoffe & Graff Vynda-K & Sholakh & a decent level of wit, rather than flat out comedy. The performances rise to the material too. Ian Cuthbertson's Garron, con-man & blagger, is played to perfection with a smarmy pomposity & pride. His relationship with the younger, less cynical Unstoffe (Nigel Plaskitt) is one of teacher & student with Garron keen to show Unstoffe the perils of honesty in a tough universe. Garron is from Earth - Hackney Wick to be precise - but the Earth he comes from almost seems to be the Earth of the present day. There's some amusement at his - & Unstoffe's - Somerset accents with the Doctor's line about 'perhaps he's a cricket scout...' being a favourite of mine. The Graff Vynda-K (Paul Seed) is a borderline psychotic warrior prince with an over-blown ego & a tendency to shoutiness. His relationship with Sholakh (Robert Keegan), who is the Graff's long term right-hand man is deeper than the difference in rank might indicate. In fact when Sholakh is dies you might feel their relationship is more than platonic. It certainly pushes the Graff right over the edge, driving him to remember battles past & he goes off to his shouty death calling for Sholakh. It made me think of the relationship is between Achilles & Petroclus, although perhaps I'm reading too much into it & should get out more. On the subject of shoutiness this story also features another Prentis Hancock performance. He's not the world's greatest actor Prentis but is reliably angry & shouty. I mention it as in passing as I'm developing a bizarre fondness for his occasional appearances, although (sadly) I think this is his last. The other performance worth noting is Timothy Bateson's as Binro 'The Heretic'. Quite rightly people have commented on the scene between him & Unstoffe where Binro explains his theory about the lights in the sky being other suns, not ice crystals. It's almost totally irrelevant to the story but it is a lovely little two hander, played with real conviction. It is therefore one of the more genuinely moving scenes in Doctor Who. It's a master class in showing how to draw emotion from something & someone without laying it on with an RTDesque trowel. 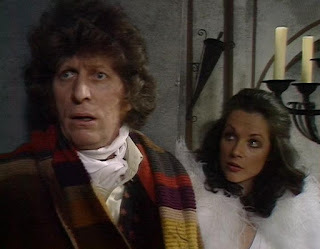 This is also Mary Tamm's first story as Romana, who has been foisted upon the Doctor by the White Guardian. The Doctor is not impressed & neither to be honest is Romana. Romana is played as all academic smarts & ego versus the Doctor's more practical experience. It's nicely done, especially in the early TARDIS scenes & right at the end. I suspect the long shot of Mary Tamm that introduces her, which runs from feet to head, is the nearest we've ever seen to a televised letch on Doctor Who. It's certainly impressive. The costume looks great, as does Mary Tamm to be fair. So as a first story of a season with one objective it does an excellent job. Romana is in & nicely established; the Key to Time concept is explained (if not in great detail) & the scene is set for the rest of the season. It's also obvious that we are continuing the tendency towards more humour & 'silliness' that began with Graham Williams's appointment as Producer. The script is filled with wit & there's some nice 'stuff' at the beginning of episode three between the Doctor & Garron in front of the Graff's firing squad, which I enjoyed but might have aggravated a few people who like their Doctor to be pretty serious. There's definitely a divide between Doctor Who fans who like comedy & those who don't. For example Donald Cotton is one of the series best Doctor Who writers in my opinion (up there with Robert Holmes & Douglas Adams) but his Hartnell stories used to be looked down upon somewhat for their high comedy level. This 'Key to Time' Season & Season 17 that follows are often accused of going too far with this 'silliness' but I'll talk about this more as we go on. Oh & some point I must write something about the Doctor Who tradition of hiding in plain sight. It's a glorious part of the series history, often overlooked & Episode One of the Ribos Operation features a superb example.